Pattaya is a city in Thailand, located on the east coast of the Gulf of Thailand, about 165 km southeast of Bangkok located within but not part of Amphoe Bang Lamung in the province of Chonburi. The city of Pattaya is a self governing municipal area which covers the whole tambon Nong Prue and Na Kluea and parts of Huai Yai and Nong Pla Lai. It is located in the heavily industrial Eastern Seaboard zone, along with Si Racha, Laem Chabang, and Chonburi. Pattaya was a small fishing village until it was discovered by Bangkok residents in the 1960s. Soon thereafter, servicemen from all over Southeast Asia, including the United States Air Force base at U-Tapao in neighbouring Rayong province began using the area for "rest and recreation." Today Pattaya is Thailand's premier beach resort and attracts annually more than a million tourists from all over the world. 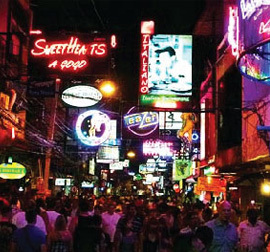 Pattaya provides high standard hotels, restaurants, sports, entertainment and shopping facilities. The resort is Thailand's most important diving center and the east coast is also a paradise for golfers. There are many interesting activities in lively Pattaya. Either you are an outdoor person or a night life city type, a shopaholic or love to spa, you are able to find all the places in Pattaya. 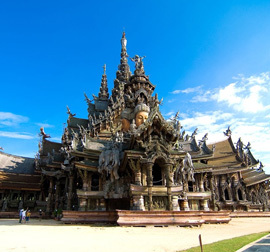 Let us introduce you to some of the popular places in Pattaya. 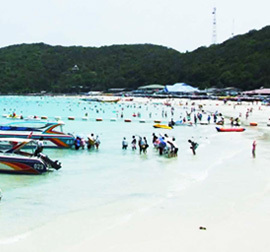 Ko Lan, or "Coral Island", is a small island situated 7.5 km west of Pattaya. Ko Lan is accessible by speedboat and ferry. The ferry departs hourly, and is a 45-minute ride costing just 20 baht each way. Speedboats are more expensive, but can reach the island in less than 15 minutes. 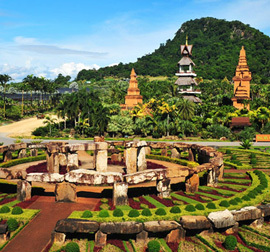 Just 15 minutes east of Pattaya, Nong Nuch Tropical Garden has emerged as a fasinating tourist destination renowned for its wide- ranging orchid species, a palm garden, various flowering from all corners of the world. 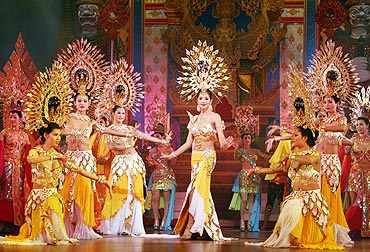 Its popular show “Cultural Extravaganza” includes Thai tradition and ceremonies, graceful dances, sword fight and much more. Moreover, the highlight program here is the elephant show. You can easily spend a whole day here. 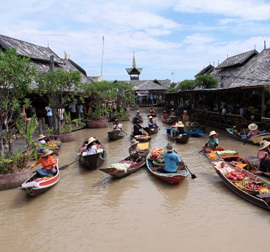 Pattaya Floating Market is a major tourist attraction, conserving Thai Culture, and covers an area of 62 Rai, almost 100.000 sqm . 10 years ago this was farm land, and home to many aquatic animals, the land was fertile with verdant florae which grew amongst the fields. It was, and still is the largest swamp within the Eastern Seaboard of Thailand. In 2005 Lake View Restaurant opened providing both Thai and international delicacies; the restaurant was built in front of the Swamp. The CEO later had the wisdom to foresee the potential of the area, whilst giving thought to water conservation, much the same way as to the Royal thinking of His Majesty the King. The CEO has given much thought to the life project to demonstrate the beautiful and simplicity of the Thai way of life, and to present this fascinating culture of the East to the rest of the World. Walking Street is a carnival of shopping, eating and night life that can't be beat. From 7 pm to midnight and sometimes till 2 am it is closed for any vehicles so you can safely walk and enjoy it. Come and experience the street carnival of Pattaya! There are some popular places those have fantastic caberet shows for you to enjoy . With the sound and lighting effects you are sure to be enjoyed for the whole night. "Popular ladyboy show | Great entertainment for all" You haven't been to Pattaya if you miss the world-famous Alcazar Cabaret Show. 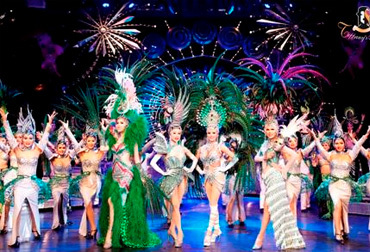 One of Thailand's foremost ladyboy cabarets, Alcazar has been a true feast for the eyes for over 20 years. Prepare to be thrilled by 400 dazzling, talented artists and entertainers who will deliver fun-filled performances including comedic impersonations and dramatic numbers. "Popular ladyboy show | Great entertainment for all" With over 28 years of stage experiences, Tiffany's Show ranks among the most spectacular ladyboy shows in Thailand. Flawlessly impersonated by Tiffany's talented performers, meet the world's most fabulous divas like Barbara Strisand, Donna Summer and Whitney Houston, among others, in the 1,000-seat theatre fully equipped with modern light and sound stage equipment.